EnLabel is the powerful label design software which provides high quality label printing solutions for users in retail, logistics and many other industries. It allows you to place texts, graphics, symbols, barcodes, lines and boxes onto your labels. EnLabel is available in either a design and print version or a print only version. The design and print version offers you the ability to design your labels and print them. 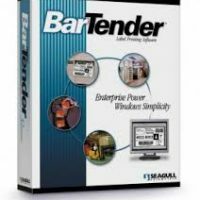 The ability to use your software on any windows printer including thermal transfer printers, inkjet printers and laser printers. The ability to access data from any database. This is great if you already have a database full of contacts. You can connect to your existing database via the EnLabel software and either change the data stored within the database or use the information to print onto your labels. Perfect for address labels or many other labels. 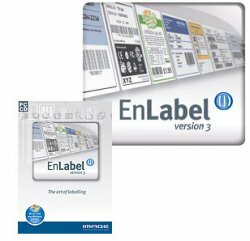 EnLabel simplifies paper handling, simply define the printer type, the source of your label design and the size of the labels and leave EnLabel to automatically configure the printer for you. This ensures a smooth process, making it easier for you to print labels. Simple wizards for quick and easy design. A print only version of EnLabel is available. You cannot design or alter the design of any labels with this software. It only enables you to call up the stored label design and print the label. Separate print programme allows anybody to call up a stored label and print the label without altering the design in any way. This is great in multiple environments such as warehouse environments as it avoids any unauthorised changes to the label design. This means your label design will be printed correctly every time. Simple to use interface making it easy for anyone to print desired labels.